The architects of the new building were Francis and George Holme, members of an important Liverpool family of builders and railway contractors. Francis Usher Holme - 1843/4-1913 - trained as an architect in Edinburgh and London, and worked in the office of Sir Charles Barry, designer of the Houses of Parliament, before retuning to Liverpool. He was Surveyor to the County of Lancaster, and in this role he did much work in connection with the design of roads and bridges. In partnership with his uncle George Holme - 1822/3-1915 - he designed the Conservative Club in Dale Street built 1882-3, it later became the Municipal Annexe and will shortly become a hotel. George Holme also designed the Homeopathic Hospital in Hope Street (1887), now the Hahnemann Building of John Moores University. 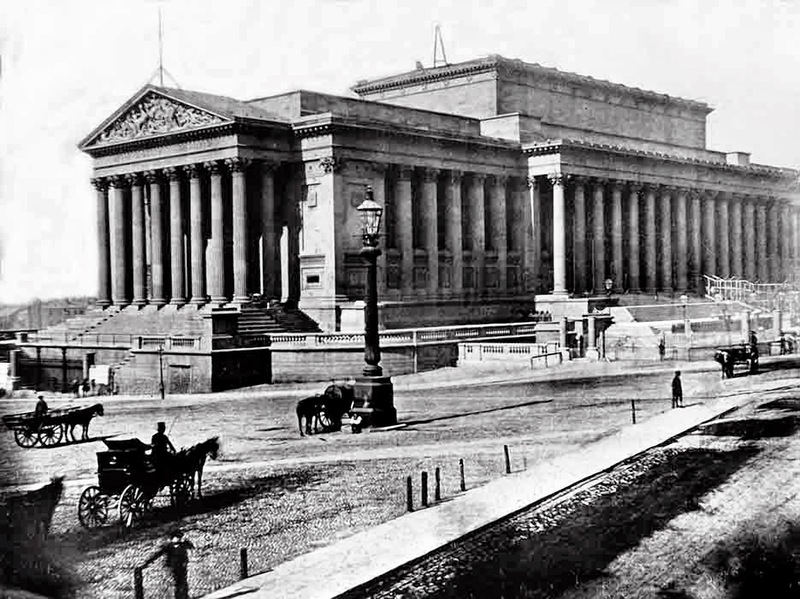 The County Sessions House is part of the row of public buildings which line the north side of William Brown Street, In appearance and function these buildings are similar in design to the nearby St George's Hall built between 1841-56 and designed by Harvey Lonsdale Elmes and C. R. Cockerell. The first of the William Brown Street group of buildings to be built was the Museum and Library (1857-60, by Thomas Allom and John Weightman), followed by the Walker Art Gallery (1874-7, by Cornelius Sherlock) and the Picton Reading Room (1875-9, also by Sherlock). The exterior of the Sessions House is decorative with stonework of varied colours, and very little plain, unadorned wall surface. The Sessions House reflects a general trend in 19th century architecture away from restraint and simplicity towards greater elaboration, however, this elaboration does not extend beyond the main facade. As with all the William Brown Street buildings, the Sessions House was designed to be seen from the front. The back and the less visible parts of the sides are treated in a much more utilitarian way and are built largely of brick. The internal planning is extraordinarily complex and irregular. This complexity was dictated by the building's original function. Magistrates and barristers came in by the front door, solicitors and witnesses entered through a side door in Mill Lane, prisoners were delivered to the cells through a gate on the east side, and members of the public who came to watch the proceedings had their own entrance at the back. Once inside, the arrangement of stairs and corridors was designed to ensure that these four categories of user did not have to meet until they confronted each other in one of the courtrooms. Today's visitor exploring the whole building may find the interior a confusing maze, but its original users would probably have had no need to venture beyond their own clearly defined area. The complicated subdivision into many small offices, not all of them adjacent to external walls, made it difficult for the architects to admit natural light to every part of the building. They overcame this problem with considerable ingenuity through the use of roof lights, glazed doors and wrought iron grilles. The basement of the building was entirely occupied by cells, the ground floor - the most altered part of the building - originally had further cells, accommodation for solicitors and witnesses, and a summary court. The first floor contained two court rooms and accommodation for magistrates, barristers and jurors; the top floor had a room for the Grand Jury, a dining room and a caretaker's flat. The most richly decorated interiors are the entrance hall and the magistrates' room. The entrance hall uses costly, carefully-worked materials - Penmon marble for the steps and columns, mosaic flooring by Mr Swift of Liverpool and Mr Burke of London. The design is based on a Romano-British floor discovered at Medbourne, near Market Harborough, Leicestershire. The floor was laid under the supervision of Henry Dibben, a railway engineer who produced an accurate drawing of the Romano-British floor, which perhaps also reflected George Holme’s interest in archaeology. The magistrates' room has elaborately carved panelling and a sumptuous plaster ceiling. Elsewhere in the building, ceramic tiles are widely used for their colour, and for reasons of hygiene and durability. The wall tiles in the large court and on the staircase were supplied by Burmantofts of Leeds. The stained glass in the large court, showing the royal coat of arms, is by Shrigley and Hunt. 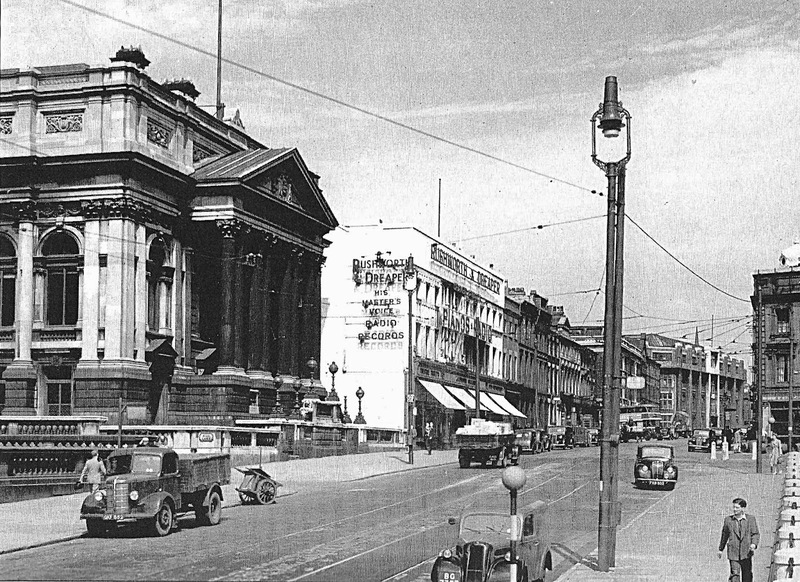 The building was heated by hot water in addition to open fires and ventilated by Mr Baker's “Acme” system (Baker was Liverpool-based, and also supplied the ventilating system for F and G. Holme's Conservative Club). The vents through which used air was extracted can be seen in the ceilings of both the large and small courtrooms. The provision of air conditioning marked a big improvement over the Police Court in Basnett Street, which had been severely criticised for its overcrowding and poor ventilation. The Courts Act of 1971 abolished Quarter Sessions. 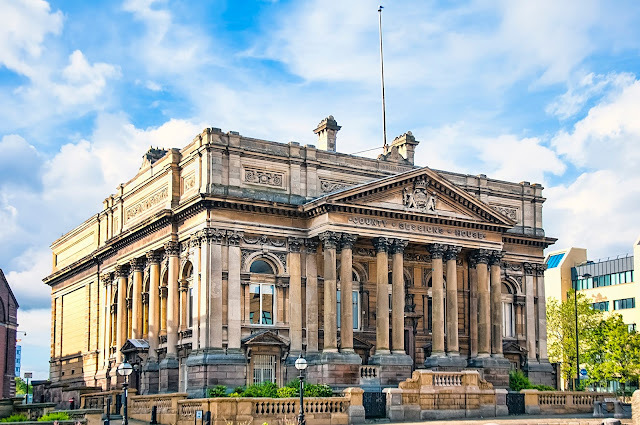 After ending its role as a courthouse, the County Sessions House accommodated the Merseyside Museum of Labour History for some years. Since 1984 the building has been in the care of National Museums Liverpool and currently houses the Fine Art Curatorial and Learning Departments, Print Room and the Rex Makin Lecture Theatre, all part of NML's Art Galleries Division. Interior view of the magistrate's room at the Liverpool Sessions House. The Sessions House was built in 1882-1884 by the architects F and G Holme, for whom the image was taken.